This game was made for the Relic Castle Game Jam #4! As a pro Birdkeeper, you have been hired by Professor Finch to help him investigate some bird business. From his lab you need to head out in each direction to find some special birds and collect their feathers! ›Choose your starter from a pool of options that include different movesets and abilities! ›Soft resetting for that shiny starter? See it instantly when you start the game! ›Fight Boss Birds to unlock the paths to secret boss battles in other areas! ›You can beat the bosses, but they're all able to be captured if you want to challenge yourself! ›Fight those bosses in any order you choose, because this game is open world! ›What else is in this game? ›Field moves that aren't tied to learning specific HM moves! ›But if you like moves there's tons of TMs to customize your team! ›More characters appear as you play! That means more trainers with stronger Pokemon! If you've downloaded the game before this post: please re-download it! There was a crash fairly early in the game due to a small oversight. It's fixed now! One of the games I have been looking forward to ever since our chat!!!! This is going to be fun! I don't understand what this spoiler means...? Is there a part of the game that's really lacking? Sorry for my strange words. It is a type of motivation. I loved your game so much I really like it. Found a sneaky exploit (by accident). When you battle the nurse in the Pokecentre her Chansey gives lots of experience yes? She also give out about $2000 for victory as well? 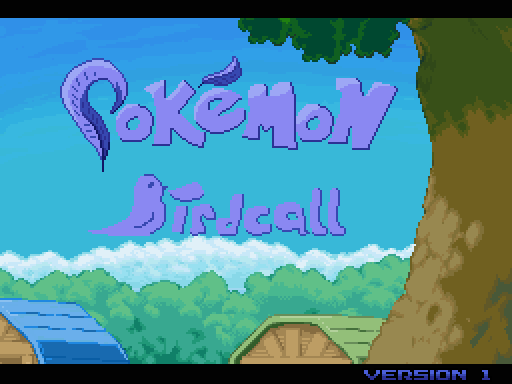 Well, you can battle her infinitely and get lots of easy coin and exp without having to leave the Pokecenter. This is a little game breaking so maybe a battle limit is needed?. Pokemon used: Special ability Dodrio. Move used: Acrobatics. Level starting the exploit: 26. 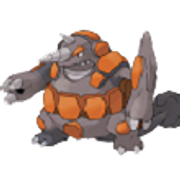 EditEdit: Also, this is off topic, how does Bonsly use Rock THROW when it has no arms?!? Downloading it now; I'll play it and tell you what I think! I got a couple private messages about a door in the factory not working correctly, and locking the player character in the wall. The main post is updated with the link. I got a couple private messages about a door in the factory not working correctly, and locking the player character in the wall. Sorry, but here's the patch for that fix! The main post is also updated with this link! The game's name didn't change, so the new game should read your old save file no problem! Feel free to completely trash the old version, because save files are stored in a separate section of your computer. If you already completed that sidequest, it wouldn't swap out the reward item for the new thing, so you'd miss out on that. If you're one of the people who were trapped in the wall and saved in that spot, you might have to restart (or send me your save file and I'll fix it) but otherwise there weren't major changes in this update. 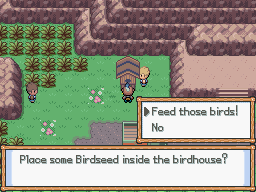 For some reason I cannot find Articuno. 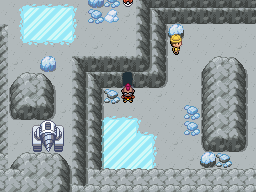 Is there something to do with that ice puzzle (the big one with a ladder at the end) because I have spent 1 or 2 hours trying to solve it (brain currently in porridge state). Just saying this incase there is a bug or missing doorway/rock. I finished the game tonight and I must say it was a blast! I really like this style of game/the vibe it gives off. You know what you have to do, now go exploring and do it! What really puts the nail in the coffin about how well this game pulls it off is the depth in the world. There are plenty of side activities to keep you busy even after you do the main objectives, really adding depth to this game, it isn't a flat, go here, do that, get that, beat that, all the way to the finish line. There is freedom and there are pathways to stumble down. Any glitches I encountered have already been fixed, this was certainly a fun time, thank you. Trying to rack my brains to find something that I can offer critique about: while I do like the maps, (I thought the quarry was very well done, and I always love maps with elevation, so the mountain had me there, and then the factory, it just looked so pretty with the fogs and the open roofs outside, looked kinda like something from zelda) I could be blind and maybe have missed a path, but with the exception of the factory, once you clear the dungeon, you have to walk back the way you came from, there is no quick way back to the start which is a bit annoying. But yeah that's all. Articuno is in an outdoor area of the Quarry! It's not too hard to get a little turned around since there's a couple directions to go...if you've ended up in the area with a bunch of engineers standing around a drill, backtrack just a little and you'll find an indoor space that branches in a couple directions with sliding puzzles. The Quarry and Volcano both have a hiker near the end who will take you out if you just ask him to! I thought making him a different color would be enough to stand out but there are trainer varations in this gamer already so I'll try to think of something more obvious...maybe I'll try working something in with the area's feather unlocking an easy backtrack route. That movie reference says it all. Great job, guys. Man this game is tough, the first "boss" I opted for is taking a bird 💩 on me. Okay! So I played this game (a... lot) and I got pretty far! Here's my in-game team (Yes I know Regi's not a bird but when fighting Zapdos it helps to have something that's NOT weak to electric and dies in 2 hits). 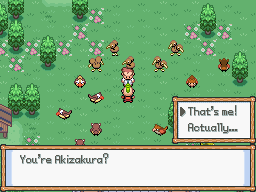 Also shinies must be WAY more common because I have 2 on my team (Azami and Excalibur) as well as a Magby I caught and a Magmar I accidentally KO'ed and a Delibird. I love it when short fangames raise the shiny rate, it makes the game so much more surprising and fun. Haha, I'm glad you like all the birds! and it's cool seeing your team, more people are catching the bosses than I thought. The Clear Bell doesn't unlock anything, at least not yet! If/when we get the chance to work on another big release I would add in some "postgame" bell content.